Russia's Foremost LGBT Leader in LA! In a bid to promote the prominence of this May's Moscow Pride and thus hopefully forestall threatened repression by the authorities, Russia's foremost gay leader, Nikolai Alekseev, will tour seven U.S. cities February 26 thru March 6. For the last five years, lesbian and gay activists in Russia have faced beatings, government bans, intimidation and arrests simply for trying to establish their right to demonstrate for equal rights, let alone winning the rights themselves. Joining Alekseev on the tour will be Andy Thayer of the Chicago direct-action group, Gay Liberation Network (www.GayLiberation.net), which is the national sponsor of the tour. Thayer has participated in the last two illegal Moscow Pride and written extensively on the subject. Alekseev will also present the U.S. premiere of a short film documenting the history of Moscow Pride. All major religious denominations and political parties in the country have called for continued government repression of Moscow Pride. 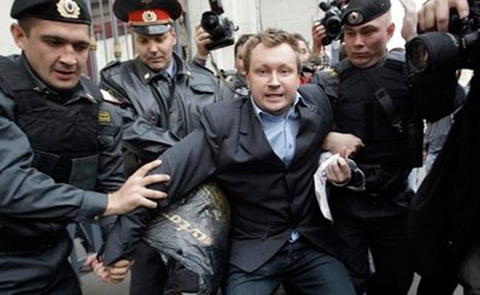 Yet after more than five years of "illegal" protests and legal battles in the Russian and international courts, in late October Alekseev's GayRussia organization (www.GayRussia.ru) alone among the myriad opposition groups in the country won the first-ever victory in the European Court of Human Rights. The European Court ruled that Russia had violated Russian LGBT's right to assemble and order the government to pay GayRussia the equivalent of $40,000 US. But the Russian government appealed the Court's ruling and yesterday Moscow's newly appointed mayor, Sergei Sobyanin, vowed to ban the Pride demonstration anyway (http://en.rian.ru/society/20110216/162636979.html). A ruling on the Russian government's appeal of the European Court decision is expected before the May 28th demonstration. Legal or "illegal," Russian lesbians and gays have vowed to go forward with their protest. Assuming, as is most likely, that the European court rejects the Russian government's appeal, the Russian authorities will be confronted with a choice which will reverberate far beyond LGBT issues: Either jeopardize closer ties to Western Europe by ignoring the court ruling, or obey the ruling and gain greater international legitimacy by being seen as a nation improving its human rights record. The final answer will come on May 28 when GayRussia has scheduled Moscow Pride 2011. WEST HOLLYWOOD, CA – Saturday, March 5, 3-5 PM, West Hollywood Park Auditorium, 647 N. San Vincente Blvd. Hosted by the Lesbian and Gay Advisory Board and the City of West Hollywood. The California portion of the tour is presented by Equality California (EQCA) and Robin Tyler Productions, Inc. The California California Travel Sponsors are Nicole Murray Ramirez, San Diego City Commissioner & The Imperial Court of Canada, United States and Mexico. California co-sponsors are: Harvey Milk Foundation; Christopher Street West; Marriage Equality USA; Get Equal; Equal Roots; Golden Rainbow Center SAGE; Los Angeles Lesbian and Gay Center; San Diego LGBT Center; National Center for Lesbian Rights; UCSF LGBT Center; Commonwealth Club of San Francisco; Alice B. Toklas LGBT Democratic Club; Harvey Milk LGBT Democratic Club; Bayard Rustin LGBT Coalition; Jordan Rustin Coalition; Jewish Community Relations Council, Kol Ami; IGLHRC Bay Area; and, Gays Without Borders.